While working in your Mailchimp account, you may see an error message that prevents an action from being performed. In many cases when there is an error, you'll see the Please check your entry and try again message. This message means there is an issue with data placed into a field on that page. Look for any fields on the page that are outlined in red for a better idea of what information is missing or is incorrect. In this article, we run through some of the different error messages that you may see and explain how to fix them. Error message: Sorry, we couldn't find an account with that username. Can we help you recover your username? What it indicates: The username that was used to log in is not tied to an account in our system. How to fix it: Check for typos or try any other usernames that may be associated with the account. If that doesn't work, click the username link in the error message to use our Recover Username tool. Error message: Sorry, that password isn't right. We can help you recover your password. What it indicates: The password that was used to log in is not connected with the username that was used to log in. How to fix it: Carefully type in the password again to avoid any typos, or try any other passwords that may be correct. If that doesn't work, click the recover your password link in the error message to use our Password Reset tool. Error message: Another user with this username already exists. Maybe it's your evil twin. Spooky. What it indicates: The username you used to sign up for an account is already in use by another Mailchimp account. How to fix it: Input a different username. If you believe that you signed up with the username previously, use our Recover Username and Password Reset tools. What it indicates: Your account is on our Forever Free Plan and has exceeded the maximum number of total subscribers that can be in the account without upgrading to a paid account to send. Under this plan, if you have more than 2,000 subscribers combined across all lists in the account, you will no longer be able to send campaigns and test emails. How to fix it: Review our paid plans and upgrade to the plan that best meets your needs. 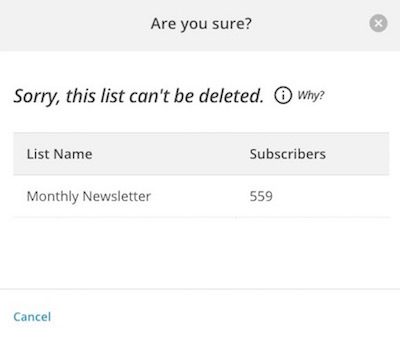 You can also unsubscribe people from your lists to reduce your account's total subscriber count to 2,000 or fewer. What it indicates: The domain for the Default "from" email has not been verified. Verification makes sure you or your company has access to the domain you are using. How to fix it: Click verify domain in the message to verify your domain. You can also verify your domain in the account Settings menu or from the From section of the Campaign Builder. What it indicates: The URL used in the redirect field for the Signup "thank you" page or Confirmation "thank you" page is not a valid URL. How to fix it: Check that there are no typos in the URL. Copy and paste the URL into your browser's address bar to see if the webpage is available. If it is not available, check with your web developer or host to determine why the webpage is down. 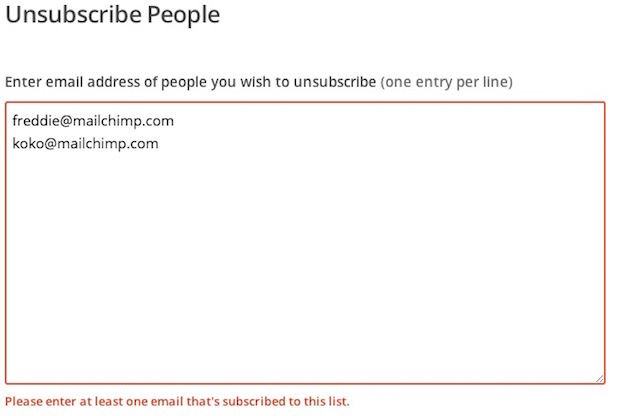 Error message: Please enter at least one email that's subscribed to this list. What it indicates: None of the email addresses entered into this field are subscribed to the list. How to fix it: Check for typos in the email addresses. If that doesn't seem to be the issue, import the subscribers to the list first and try to create the segment again. Error message: Please enter at least one email that's subscribed to the list. What it indicates: None of the email addresses entered into this field are in the list. How to fix it: Check for typos in the email addresses. If that doesn't seem to be the issue, search for subscribers to see if they're on different lists in the account. Error message: [Address] is an invalid email address and cannot be imported. 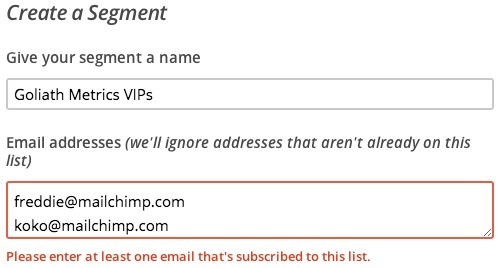 What it indicates: The email address or domain is prevented from being added to users' lists in Mailchimp. This can occur when the owner of the email address or the domain has contacted our Compliance Team to request that they not receive emails that are sent from any Mailchimp user. Additionally, our Delivery Team occasionally disables email addresses or domains that could negatively affect our delivery rate. How to fix it: Check for typos in the domain. If it is correct, contact the owner of the email address or domain and have them contact our Compliance Team to request that their email address or domain be removed from the blacklist. Error message: No subscribers were added to your list. What it indicates : There were issues with the email addresses you tried to import. How to fix it: Check for typos, extra spaces, and other issues that may cause syntax errors. Email addresses that are role-based cannot be added in a list import. Error message: Too many subscribe attempts for this email address. Please try again in about 5 minutes. What it indicates: The email address cannot be subscribed to the list because too many attempts have been made to add it within a short timeframe. It can also indicate browser-related issues. How to fix it: Wait several minutes to see if you are able to successfully sign up with the email address or try a different browser. If your browser has an auto-fill setting, try turning it off—it can fill a hidden field that we include in the code to prevent spam signups. Error message: Sorry, this list can't be deleted. What it indicates: The list you want to delete has been sent to in the past seven days. Lists are required to remain in the account for seven days following a campaign or automated email being sent to give time for subscribers to unsubscribe and reports to be collected. How to fix it: Pause any active automations or RSS campaigns that are sending to the list you want to delete, then wait seven days after any subscriber in the list was last sent to. After the seven-day period has passed, all bulk options will be re-enabled and can be used on the list. It would also be possible to unsubscribe the email addresses, wait seven days, and then delete the list. Error message: Sorry, the 'delete' bulk operation is not available for this list right now. What it indicates: The list in which you want to perform a bulk operation has been sent to in the past seven days. Lists are required to remain intact in the account for seven days following a campaign or automated email being sent. How to fix it: Pause any active automations or RSS campaigns that are sending to the list you want to edit, then wait seven days after any subscriber in the list was last sent to. After the seven-day period has passed, all bulk options will be re-enabled and can be used on the list. You can delete individual subscribers from their subscriber profiles before the seven-day period has passed, or you can unsubscribe them instead. Error message: Sorry, the 'move-list' bulk operation is not available for this list right now. What it indicates: The list you want to combine into another list in your account was sent to in the previous seven days. How to fix it: Pause any active automations or RSS campaigns that are sending to the list you want to move, then wait seven days after any subscriber in the list was last sent to. After the seven-day period has passed, all bulk options will be re-enabled and can be used on the list. You can also export the list you want to move and import it into your master list. Error message: Sorry, “[TAG]” is reserved and can't be used. What it indicates: Your new merge tag is a reserved system tag that Mailchimp uses for something else. How to fix it: Rename your merge tag and avoid these reserved tags. Error message: [RSS feed URL] is not a valid RSS feed. What it indicates: The feed URL placed in the RSS Feed URL field is not a valid feed. How to fix it: Check for any typos in the feed URL and try other troubleshooting steps. Using a feed validation service will also give a good idea of where the issue may be originating. Error message: You can't upload an image of this type. What it indicates: The file uploaded into an Image block was not an image file. How to fix it: Upload the file directly into the Content Manager or into a Text block. If you are trying to upload an image, make sure it's one of our supported file types (JPG, JPEG, JPE, PNG, GIF, and BMP). What it indicates: Your account is on our Forever Free Plan and has exceeded the maximum number of total subscribers that can be in the account without upgrading to a paid account to send. Under this plan, if you have more than 2,000 subscribers combined across all lists in the account, you will no longer be able to send email campaigns and test emails. Error message: To send, you need at least 1 subscriber in your list. What it indicates: The list or segment selected on the To section of the Campaign Builder does not have any recipients. How to fix it: Choose a list or segment that has recipients or import subscribers to the list. Error message: [domain] must be verified to send from this address. What it indicates: The domain used as the From email address for the campaign has not been verified to make sure you or your company have permission to use it. How to fix it: Click verify this domain in the message to verify your domain. You can also verify your domain in the account Settings menu or from the Settings for your list.